Today's Vinyls — Durable Beauty! Whether you prefer traditional, contemporary, or country, our large selection of vinyl flooring will help you find the right style and color to match your kitchen, and bathrooms decorating schemes. 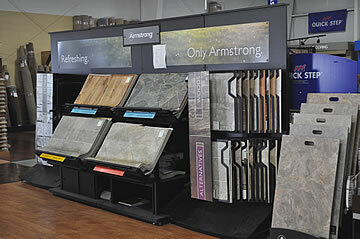 We feature Nafco luxury vinyl flooring and Armstrong vinyl floors. The hottest trend in vinyl flooring today is towards natural looking designs that reproduce the visual appearance of ceramic tile, hardwood, and stone. Nafco's PermaStone™ offers beauty, durability and affordability. That's why so many homeowners are moving to the advantages of Nafco luxury vinyl flooring. The realistic look is made even more attractive by Nafco's exclusive Tritonite wearlayer, stronger than aluminum oxide and other conventional coatings. Nafco's long-lasting resilience is a superior alternative to the problems associated with replacing actual wood or stone flooring that's been damaged. With the realistic look of natural stone, slate and marble. Carpet Values is more than just a Kentucky vinyl flooring store, we are your flooring experts! Here are some points to follow after your new vinyl floor has been installed. Keep traffic minimal during the first 24-48 hours after your floor is installed. This is to allow the adhesive to cure properly. Don't put any heavy objects on your floor for 24-48 hours. This allows the adhesive time to cure and helps avoid heavy objects from displacing the adhesive and causing permanent depressions in your new vinyl floor. If your floor has seams, avoid stepping on the seam sealer for at least 24 hours so the sealer has time to dry properly. Do not scrub, or wash your newly installed vinyl floor for a minimum of 3 days after the installation. If you have to clean, do a spot clean, and avoid all seam areas. When moving heavy furniture, or appliances across your vinyl floor, always place wood, or hardboard down to use as a runway. Never move the object directly on the vinyl surface. If the room your new vinyl floor is installed in has direct exposure to sunlight, try to protect your floor from fading by using blinds, shades, or curtains during peak sunlight hours. If you accidentally cut, or gouge your floor, place a piece of non-staining tape of the area and give us a call. Avoid washing or allowing traffic on the damaged area until we get it fixed for you.